If you know how to treat them, whiteheads can be simple and easy to treat. Below, we’ll show you the different categories of whiteheads and help you formulate a plan to get rid of whiteheads, for good. Additionally, you can take our skin quiz to discover the right skin care regimen to treat your whiteheads based on your skin type, age, ethnicity, and lifestyle. 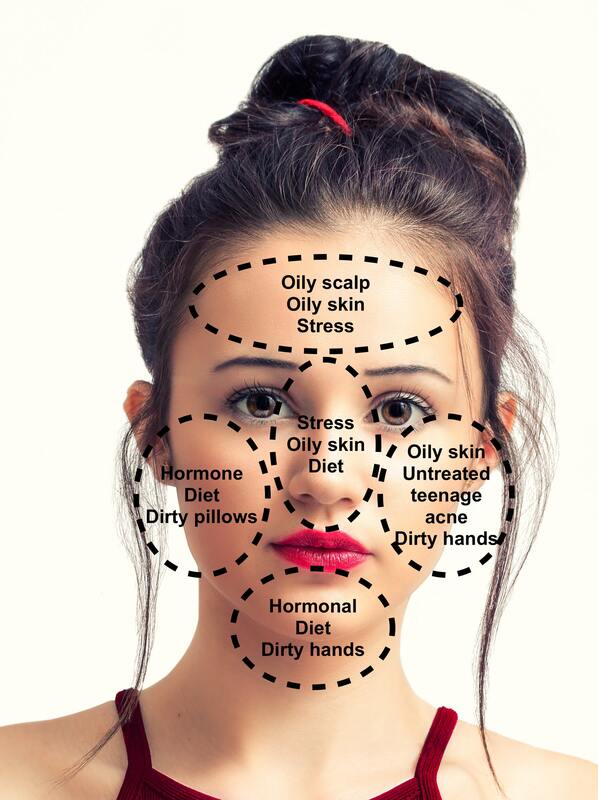 FACE MAPPING - what do your whiteheads mean? Take our skin quiz to discover the best skin care ritual based on your skin type, age, ethnicity, diet, and lifestyle. If you’re seeing whiteheads occur on your nose, you’re not alone. The nose is one of the most common areas to have whiteheads because the T-zone of your face (your forehead and nose) produces a lot more oil than the rest of your face. Whiteheads found on the nose are usually accompanied by blackheads, and because of how common these can be, they are actually the easiest to treat. By washing your face twice a day with an exfoliator that contains salicylic acid, glycolic acid, or lactic acid, you will see a huge improvement in the appearance of whiteheads on your T-zone and nose. Whiteheads can take longer to clear than blackheads because the clogged pore is deeper under the skin so this routine can take some time to see results. Beware of products labeled “scrubs”, as they can often over-exfoliate your skin, causing micro tears and making skin even more vulnerable to a bacteria attack, leading to inflamed pimples. Additionally, drying out your skin can cause your skin to overcompensate by producing excess oil and leading to more acne. For additional guidance, take our skin quiz and let us calculate the perfect amount of exfoliation for your unique skin. If you’re experiencing whiteheads on your forehead, that is because the forehead produces more oil than the rest of your face. The best way to treat these breakouts is the same as above, with gentle exfoliation and treatment. If you have hair that hangs down onto your forehead, like short bangs, they could be causing the clogging of pores on your forehead, especially if you have oily hair and an oily scalp. Your bangs can even create tiny scratches on your forehead, and transfer oil and bacteria from your hair onto your forehead, causing acne and whiteheads. If the hair on your forehead is what could be causing excess oil production and breakouts, changing your hairstyle can improve your skin’s health and appearance. Because of the excess oil created, the best way to treat your whiteheads is with a gentle exfoliating cleanser. With this effective, deep cleaning method, your forehead’s oil production can be decreased drastically. It is key to find the right exfoliant and to not use one that is too harsh, which could tear or dry out your skin. Take our free skin quiz and see what natural, effective products we recommend for your exact skin type. Whiteheads on the chin are generally more complicated than whiteheads on the nose or forehead because the chin isn't the area on our face with the most oil production. Statistics show that chin acne and whiteheads, in particular, tend to be caused by hormonal changes. A rise in androgen levels can trigger higher sebum production and thicker sebum, which can cause chin acne. To get rid of whiteheads on your chin, first, determine if a hormonal change is the cause of the flare-up. Are your whiteheads caused by hormones? Did you recently change a birth control method? Do you have more whiteheads around your period? If your whiteheads are caused by a hormonal imbalance, it’s best to stay away from foods that could be treated with hormones, like dairy or hormone-treated meat. These foods could contain trace amounts of the hormone that is disrupting your overall hormone levels. If your whiteheads are caused by common skin congestion, you will need to exfoliate your skin and balance your skin’s sebum production. By exfoliating your skin with salicylic acid, glycolic acid, or lactic acid you can effectively clear these whiteheads. Again, be wary of using harsher scrubs, to avoid drying out your skin or causing micro-tears and opening your skin up to inflamed bacteria caused pimples. To find out the right kind of exfoliant to treat your skin, take our skin quiz and develop an effective skin care regimen built for your skin’s specific needs. You can additionally improve your skin’s sebum production by eating foods that are rich in Omega-3’s and Vitamin A. Our skin’s sebum contains both saturated and unsaturated oils. Consuming Omega-3’s can improve your sebum texture by raising the composition of unsaturated oil in your sebum and making your sebum thinner and less likely to clog pores. While some whiteheads may occur on cheeks, what you could also be experiencing is called Keratosis Pilaris (KP). KP occurs when your skin produced too much keratin in the hair follicles, creating small bumps under the skin. The cause for KP and for whiteheads is completely different, and therefore require different treatments to avoid aggravating the issue, or making it worse. KP is worsened when your skin is dry, while whiteheads tend to get worse when skin is oiliest. To get rid of these bumps on your cheeks, you first need to determine whether they are whiteheads or KP’s. If your skin is mostly clear, but you have lots of tiny small bumps on your cheeks, these are probably Keratosis Pilaris. If your skin is congested with acne in other areas, the bumps are most likely whiteheads. If you still can’t decide what these little bumps are, take our skin quiz, and we can analyze the issue for you, and help you to create the perfect skincare regimen to your skin. To get rid of whiteheads on cheeks, you must target your skin from the inside-out. A healthy diet is incredibly important for clear skin. By eating foods that are high in Omega-3 and Vitamin A, you can improve your skin’s sebum texture, increasing the level of unsaturated oils in your sebum composition, making it less likely to clog inside your pores. Externally, by exfoliating with a gentle exfoliant like glycolic or lactic acid, you can clear up whiteheads with regular cleansing and time. Although they can occur at any age, whiteheads are most common in teenage skin. Teenage skin is also the best equipped to heal from whiteheads and can get rid of them the fastest. Usually, whiteheads on young skin are caused by excessive oil production. The excess oil cannot properly flow out of pores and accumulates under the skin, causing these whiteheads. The best treatment for whiteheads caused by this excess oil is through gentle exfoliation. Exfoliating the dead skin and excess oil will unclog pores, reducing whiteheads and redness. To prevent excess oil production, it is vital to keep your skin moisturized and maintain a healthy lifestyle and diet. Whiteheads on adult skin can be trickier to treat because adult skin cells don’t regenerate as quickly. Our skin gets thinner with age and it is also easier to over-exfoliate adult skin. That’s why finding the perfect product to balance the oil levels on your face is so important. Whiteheads on adult dry or combination skin are most likely caused by hormones, diet, and the skin care you currently use. Take our skin quiz for personalized recommendations to help you find the correct exfoliant and moisturizer to keep your skin clear. Whiteheads caused by hormonal shifts are incredibly common. Any hormone change can cause whiteheads, acne, or other skin problems. The time around your period, changes to birth control methods, pregnancies, and menopause can create a rise in androgen levels which changes the composition and production of our skin’s sebum. To get rid of whiteheads caused by hormonal changes, it is important to treat the problem from the root of hormonal imbalances. A good first step is to eliminate any foods treated with hormones, as it could be affecting your natural hormone levels. This includes dairy, soy, meat treated with hormones, etc. Additionally, eating a diet that is rich in Omega-3’s and Vitamin A will help control sebum production and decrease the likelihood of clogged pores. Using a gentle exfoliating cleanser will help clear up dead skin and unclog pores. By using skin care that is natural and free of fillers, your pores are less likely to be clogged, eliminating the frequency of whiteheads and other blemishes. To find products that won’t irritate or clog pores, take our skin quiz which will formulate a skin care routine for your skin’s needs. If your whiteheads are caused by these hormonal shifts and changes to diet or lifestyle don’t help, it is best to talk to your OB-GYN or general physician to figure out the best solution to balancing your hormone levels. While some whiteheads are caused by specific health or environmental factors, some people are genetically more prone to whiteheads. The easiest way to tell if your whiteheads stem from a genetic reason is to see if breakouts like yours affect others in your family. Because you can’t alter your genetics, these whiteheads are the hardest to treat. People who are born with a propensity for whiteheads tend to have thicker sebum than other people. This is due to the composition of their sebum, with more saturated fat than unsaturated fat. There are two main ways to increase the level of unsaturated fat in your sebum, through diet and skincare. By increasing the amount of good fats, such as olive oil, avocados, and flaxseed oil, and decreasing the amount of saturated fats, like animal fat, butter, and processed foods, you can decrease levels of saturated fats in your sebum. Additionally, by using skincare products that contain ingredients with higher levels of linoleic acid such as rosehip seed oil and avocado oil can improve your sebum texture. Additionally, by gently exfoliating your skin, you can help clear clogged sebum buildup in pores, decreasing the appearance of whiteheads. Finding the right balance of these ingredients in your products can be tough, but take our free personalized skin quiz, and we can recommend products suited exactly to your skin concerns. One of the most important ways to take care of your skin is by keeping it hydrated. In many cases, your skin may be producing too much oil because your skin is dehydrated and oil prevents water on the skin from evaporating. For plump, glowing skin, you need to hydrate your skin from the inside-out. By drinking enough water and using the right moisturizer for your skin, your skin will transform into the healthy skin you’ve always wanted. To find the best moisturizer built for your skin, take our skin quiz with built-in recommendations for your skin’s exact needs. Your diet also has a huge effect on your skin’s oil production and sebum composition. The best nutrients to include in your diet to regulate your skin’s oil and sebum include Vitamin A, Omega-3, and Omega-6. Healthy fats such as fish, flaxseed oil, and produce with Vitamin A like carrots, tomatoes, and kale can help to decrease the likelihood of clogged pores, whiteheads, and other acne. An important way to streamline your diet can be to eliminate junk food. Just like how good food can help improve your skin, bad food can cause congestion in your skin. Too much saturated fat can increase the ratio of saturated to unsaturated oils in your sebum, making your skin more prone to clogged pores. Your skin might be as healthy as can be, but your skincare and makeup could be to blame for your whiteheads. Skin care and makeup that can clog your pores are called comedogenic products. These products are made with low quality, low-grade petroleum-based products. They allow makeup and skin care companies to produce more products at a cheaper cost, but at the expense of your skin. These products can be fine moisturizers for dry skin but can be harmful to congested skin. They block your pores, don’t allow sebum to escape, and can cause acne and whiteheads, increasing congestion. Make sure to avoid skincare and makeup that are made from mineral oil or paraffin, and try to use products that are made from plant-based oils like rosehip seed oil, jojoba oil, or grapeseed oil. To find natural products that are built for your skin, take our free skin quiz and create the best possible skin care regimen for you. Unbeknownst to most, your living environment can create whiteheads and other skin problems. If you live in a polluted, urban environment, you are more likely to have whiteheads. Dirt and smog can enter your skin from the air, clogging your pores and create an accumulation under the skin causing whiteheads. To prevent these environmentally caused whiteheads, you need to make sure you are consistent with a cleansing ritual to remove pollution buildup. It is also important to wear a day cream that contains antioxidants which can neutralize chemicals emitted by the pollution. To find out what natural ingredients can best counteract the effects of pollution on your skin, take our free skin assessment and create a personalized skin care regimen. As you can see, whiteheads are complex and can be caused by a large variety of things in your life. By identifying the root of the issue, and finding the cause of your specific whiteheads, you can create a specific plan to alleviate the issue and clear your skin. Blindly using whitehead treatment products without identifying the root cause, you may use the wrong products which could dry out your skin without improving your whiteheads. By taking our algorithm based skin quiz, we can use our database of scientific skin research to help you identify the type of whiteheads you have and determine the best skin care regimen for your skin and it’s needs.